While boaters and marine-related businesses deal with flooding or droughts in many parts of the country, boating is the best it’s been in years on one of the largest man-made lakes in the nation. Thanks to the heaviest snowpack in eight years, water levels at Lake Powell — located on the border of Arizona and Utah in the Glen Canyon National Recreation Area — are up, and for the first time in five years, a well-known shortcut on the lake — Castle Rock Cut — is open for boaters. The lake, which is the second-largest man-made lake in the U.S., reached 3,620 feet above sea level June 10, allowing the Cut to open. In all, the lake has risen 29 feet since its low point at the end of March. As of June 25, it stood at 3,629.12 feet above sea level. “The significance, particularly in this era of high energy costs, is if you put your boat in at Wahweap (Marina), instead of having to go all around the old historic Colorado River channel to get up-lake to a lot of the popular recreational boating and camping areas … you’ve got this very short channel and it pops you right into the up-lake environment and you save all of that detour around,” said Barry Wirth, spokesman for the U.S. Department of the Interior’s Bureau of Reclamation, which regulates water levels at the lake. For those who put their boats in the water in the lake’s northern end, the opening of the Cut signifies there’s been an improvement in water levels, even if it’s not in a portion of the lake they use. “It’s just a good barometer for the whole lake,” Wirth said. Those who work on the lake say they have seen more business and more boaters since the opening of the Cut. Lake Powell Resorts and Marinas is one of five marinas located on the lake. Ward said the change from last year to this year is like night and day. Ward said he did not have specific revenue figures for his resort and marina, but noted that business also was up at hotels and restaurants in nearby Page, Ariz., because of the influx of boaters on the lake. Steve Carothers, general manager of Antelope Point Marina, also said business is good. “All our (sales) are up except for fuel … at the rest of our marina, our sales are up,” he said. “Our powerboat (rentals) are up, but our houseboat (rentals) are pretty much flat with last year. I think that’s more to do with the economy. “Everything is up from last year significantly, actually,” he added. Carothers said the opening of the Cut actually means less boat traffic coming through his marina, but his slip owners like that. While he could not say for sure that rising lake levels were prompting a rise in sales, it’s still a good thing for the area in general. “It’s a nice shot in the arm,” he said, noting that even when lake levels are down, the water at his marina still is 400 feet deep and the lake has nearly 2,000 miles of shoreline. Max King, spokesman for the Glen Canyon National Recreation Area, said he did not have any data on the number of visitors to the area, but said anecdotally he’s heard people are happy the Cut is open. Wirth, from the Bureau of Reclamation, said those in his agency were not surprised by the rising lake levels because they receive data regularly from the River Forecast Center, which collects snow survey data from various measuring sites and provides information on the snowpack and water content. What is unknown, he said, is if this marks the end of a drought or if it’s a one-year anomaly. “We’ve been in the most severe recorded drought cycle on the Colorado River. The records on the Colorado go back about 100 years, and this has been the worst cycle in that 100 years,” Wirth said. Since 1999, inflow to Lake Powell has been below average in every year except one. 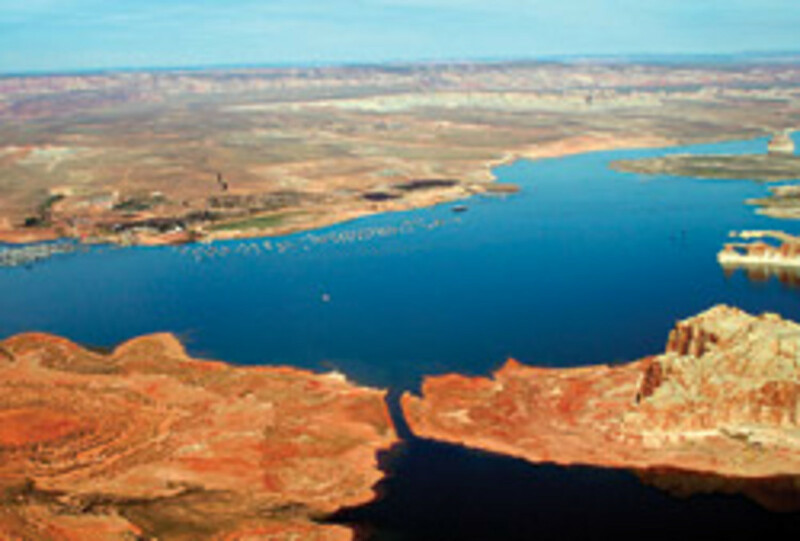 In the summer of 1999, Lake Powell was essentially full, with reservoir storage at 97 percent capacity. Because of severe drought conditions, the lake reached a low of 33 percent capacity in April 2005. In mid-June, the lake was at about 53 percent capacity, Wirth said.